High-Performance Liquid Chromatography (HPLC) is a very useful technique to separate chemical components of a mixture by passing the mixture (the liquid phase) through a column packed with some type of solid phase. There are many different variables intrinsic to a given HPLC column and experiment, such as the column length, diameter, flow rate, and run time, and these variables impact the overall result of the separation. The free HPLC calculator app by Supelco (a division of Sigma-Aldrich) provides an easy-to-use tool for researchers looking to compare conditions across HPLC columns. 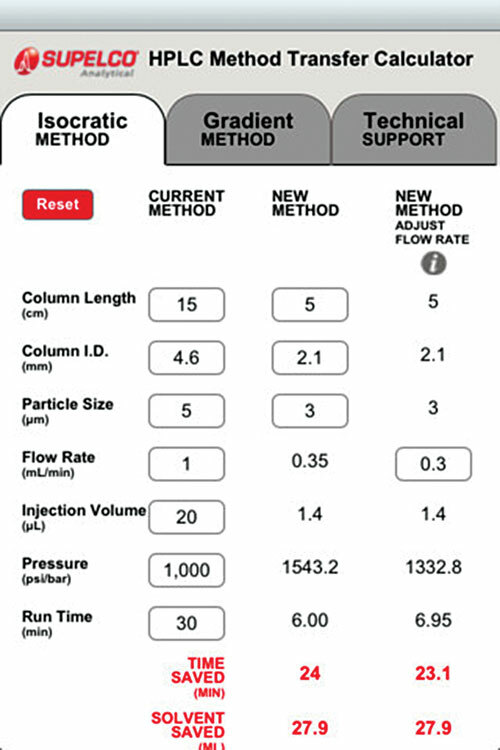 Providing separate calculators for isocratic and gradient method separations, the HPLC calculator app allows users to enter information for a variety of parameters under the “current method” heading and then compares those values to some recommended values already given under the “new method” heading. When applicable, the app calculates the amount of time and/or solvent saved by using the new parameters.